Art communities around the world are seemingly endless in support and inspiration. 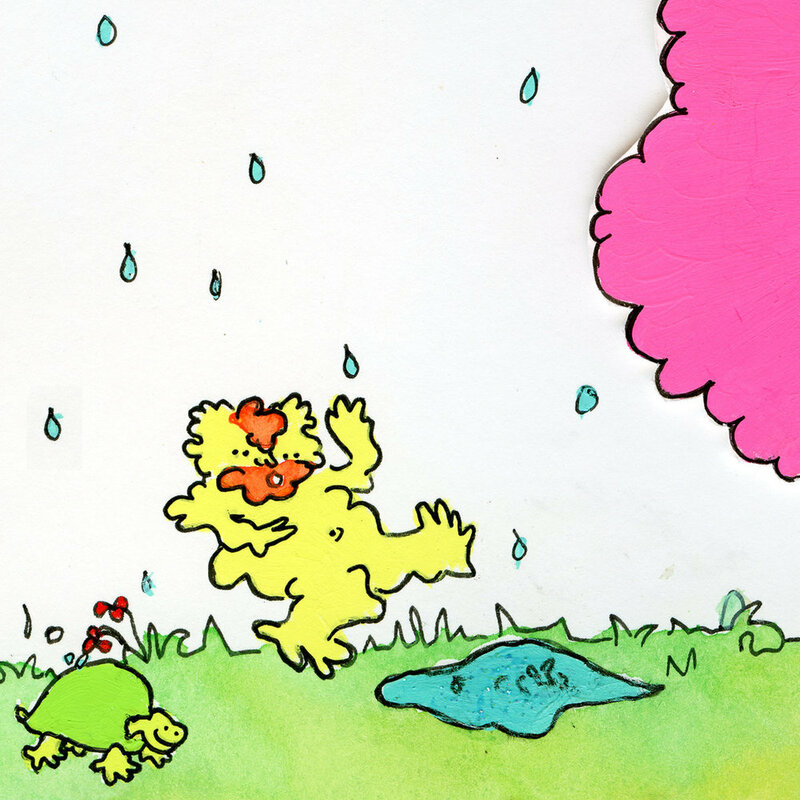 Months after interviewing illustrator Mike McPuff, he posted a children's book from a fellow Fort Collins, Colorado artist by the name of Eldo aka Eldowho. On top of releasing a children's book (complete with an album to accompany it), she's also been releasing patches, illustrations, pillows, and more. Handling everything from embroidery to claymation, I felt it necessary to send her a few questions in order to learn more about this prolific and talented being. Hey, how's it going? Where are you located right now? Describe your environment. Oh hello there, hi. I am located on a couch in a small home that is covered in threads, clay, paper scraps, shipping materials, retro musical instruments and dog fur. This busy home sits in Fort Collins, Colorado. For those unfamiliar, describe yourself in as little or as many words as you like. I make illustrations via pens, paints, papercutting, and embroidery thread. I dabble in stopmotion animation and claymation. I rely heavily on facial expressions in illustrations/stopmotions and real life to get my message across. I’m Pro-Emoji. I’m some kind of nerd, I went to college in New Jersey learning computer stuff. Machine embroidery and stopmotion animation require getting comfortable in the digital space and I spend plenty of time on the computer (picture: pasty skin) that learning new software wasn’t a huge pill to swallow. Patches, clothing, pillows, children's books. What's a normal day like for you? Weekdays I work a 9-5ish, I come home and we all eat what we believe is a nutritious meal in a short amount of time (including Regis, the dog) and then we all get to our tasks. Will C. gets to his music making, the dog to his junk licking and me to whatever is calling me at the moment. I found embroidery to be a consumable way for people to collect pieces of my art. On the weekends, I’ll queue up the embroidery machine to work on a large piece while I shoot frames for a claymation clip. I have always loved elaborately interestingly embroidered clothes. I worked three jobs at once as a teenager to pay for an embroidered gown (yup). Last year, I saw a stopmotion music video done by BlinkInk (UK production company) that was completely embroidered, frame by frame. It blew my mind. 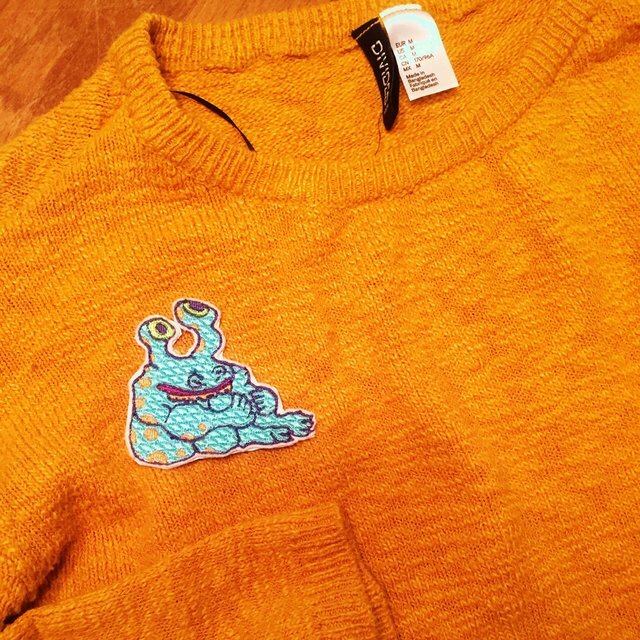 I wanted to mess with an embroidery machine for stopmotion and try my hand at embroidering funky clothes. Since my glorious preteen days, I’ve posted my art online - I wasn’t art networking IRL until recently. During those strictly online days, I had experiences via LiveJournal, Flickr and now Instagram observing artists using Society6 to put high quality reproductions of their art on home goods (like pillows) or comic bloggers taking the leap to publish a graphic novel. When the time seemed right for me to attempt those things, I had subconscious confidence seeing it done before. 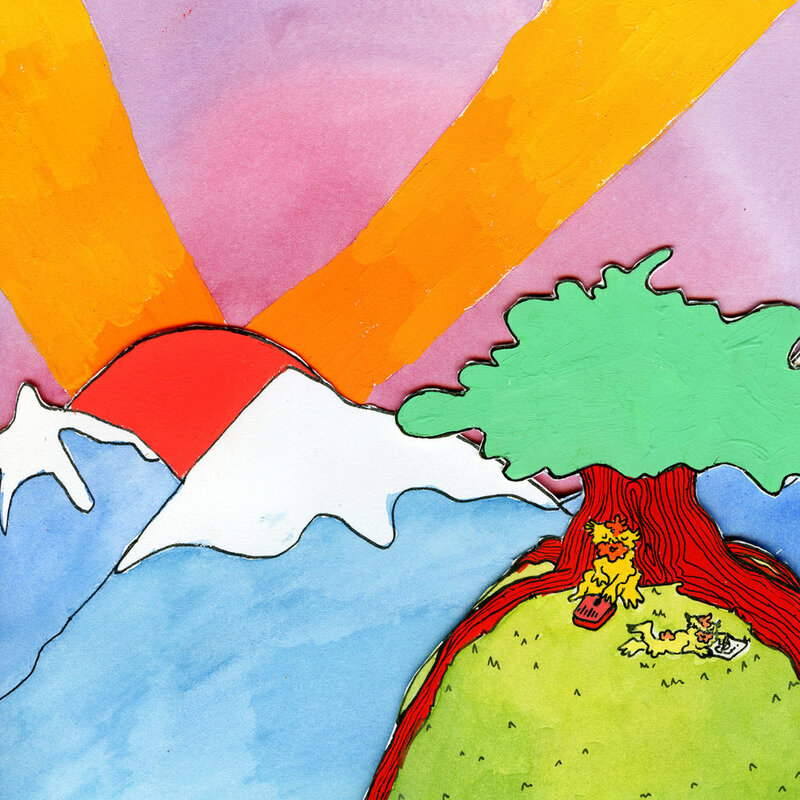 How did you first link with Will C. to create a children's book + album combination? Will C. and I have genres of different music tastes but I believe a mutual respect and the ability to lend an appreciative ear. Some of our genre circles do overlap. Take Harry Nilsson, I was getting obsessed with the album The Point! just as a turning point in life was happening. As life can go, a new love was growing and another love was physically dying. I’ve been called Google girl because I Google everything, so when life got difficult to navigate, I was Googling talks about Buddhism, meditation, and mindfulness. My energy seemed driven into painting and I was doing a lot of it during this time, listening to Will’s music, Nilsson, and talks on various healing subjects. These paintings were the DinDins. With utmost respect for Will’s musical genius, the concept of DinDins paintings meet dreamy music was barely a decision needing discussion and the project started to materialize. I put on noise canceling headphones and turn up my noise rock, all of my pens are full of ink and the clean paper flows like wine*. Or the embroidery machine is well oiled, doing its job without much intervention, and I’m using a spacious table setup for my claymation with a variety of lighting options. Today my claymation is confined to a lightbox barely off the floor. I’m a “tornado” (as once described by a parent when thought I was out of earshot). This tornadical (?) chaos is spread out among creation stations - I’ll be working on a clay scene and get inspired to get up and make a new papercut background, while paints from last night are still on the table only partially cleaned up, milky painty water just asking to be tipped over. Ideally, there would be a clone of myself that was happy to tidy as Other Eldo created. My Microsoft Surface with digital pen, Colorado relaxation tinctures, Photoshop, Dragonframe, espresso shots and dark chocolate. You've been posting claymation videos on your IG as of late. Is this is a new direction? What's that process been like? Curious people can look to early 2015 on my IG to find beginning attempts at claymation. You couldn’t have worded the question better – claymation for me has been a process of trial and error. There’s not a great Googling on how to do it! I’ve spent many months with true eureka moments or moments that seemed eureka but actually pushed me into a box for a while (literally, I need to get out of my lightbox, my back hurts). I’ve learned rigging (keeping clay bodies stable), greenscreening, onion skinning, and I am inspired to get better. I am inspired by stopmotion animation teams like BlinkInk and Open the Portal. Scene by scene, I’d like to create a full music video in clay – as a one woman team, this takes time. Just recently, I’ve upgraded to a used professional embroidery machine. I envision some new twists to my embroidery that require a different machine for the added complexity and scale. I hope to make strides this winter, I like being stuck inside with the sun down and getting immersed into projects. It was last December when Will and I received the first embroidery machine. We both had ideas for the machine, but I ended up majorly hogging it. The irritating hum from the machine’s needle thrusting is like dissonant music to my ears and the complaining error/malfunction tones elicit a response deep within me that is similar, I imagine, to how Regis feels when the doorbell rings. Is the Etsy community competitive? I actually feel Etsy is silo’d in my world. I heard from local jewelry sellers they find Etsy is competitive in that you can pay to be in special groups for increased promotion. I haven’t found this side of Etsy as a patch maker/book creator but I’m also not going “gangbusters” either like some patch/pin peeps. Regardless of Facebook algorithms, I’m thankful for Instagram and the exposure it brings to my Etsy shop. Learn what it takes to feel centered and at peace during the day or at least week, and you’ll be good to yourself and in turn you’ll be better to others. Being good to others is rewarding, the energy comes back to you. You may find yourself part of an inspiring art network if you so choose. Recognize and harness what empowers you and use it to attempt new things. Recognize what drains you and try to balance it. But what do I know? There is no “right” way to navigate life, there is only your way. Any final words/thoughts/shout-outs? Thank you! Shout out to @neonpajamas this dude is doing the good work, thank you!